Chris Komnick of the Madison Scouts and Rick Odello of Blue Devils B were both recognized during World Championships Week as directors of the year in their respective classes. 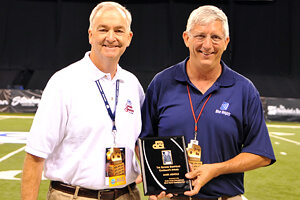 The 2012 Dr. Bernard Baggs Leadership Award — named after the longtime judge and DCI Board of Directors adviser who passed away in 1998 — was awarded to Komnick, who was named executive director of the Madison Scouts in the winter of 2009. The award is decided upon by a vote of all World Class directors. "I was very surprised, and obviously humbled by having my fellow directors vote for me for this award," he said. "It is much appreciated." For Odello, being named Open Class Director of the Year isn't anything new. He previously was honored with the award in 2010. He echoed Komnick's sentiment, saying it's a humbling experience to be recognized. "To be voted on by your peers, it feels great," Odello said. "I cherish that." Odello has been a part of the Blue Devils family since before its inception as a competing drum and bugle corps, when parents Tony and Ann founded the organization. 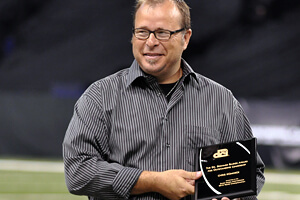 He serves as a member of the Open Class Advisory Committee and in 2008 was inducted into the DCI Hall of Fame. 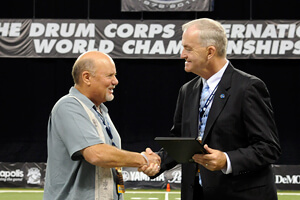 Odello and Komnick weren't the only corps directors to be recognized during the 2012 World Championships in Indianapolis. Blue Knights Director Mark Arnold was honored as the first recipient of the George Bonfiglio Chairman's Award. Named in the memory of the founder and director of the 27th Lancers, the new award is given to a person who has demonstrated extraordinary leadership, service and effort on behalf of Drum Corps International. Arnold has served as chairman of the DCI Board of Directors since 2008 after previously serving in 1994. "It's an honor to be recognized by your peers for what it is you do," Arnold said. "Especially being the George Bonfiglio Chairman's award — to honor people such as George who have given so much of their lives to make this activity available to kids." Bonfiglio served as DCI's first Chairman of the Board and was fundamental in helping direct DCI's initial growth and its increased prominence on a national and international stage. "There are so many people out there who dedicate their lives to making drum corps available to the kids and who work behind the scenes to make it happen," Arnold said. "I kind of view this award for all of those people. All those people who spend their time behind the scenes, making it happen so that these kids can have this experience. To me that's what this award is all about." Having been with the Blue Knights since 1986, Arnold joked that he won the Chairman's Award for being the oldest living director in DCI. "I'm a fortunate person," he said. "I'm blessed with the Blue Knights. It's an honor to be able to work with these kids." Contributing to this report: Christina Mavroudis.